PyGanic is the organic insecticide proven to get rid of hundreds of common garden pests. 100 years ago we created a way to extract a powerful plant-made insecticide from daisy flowers called Pyrethrum, a key ingredient in PyGanic. Since then, it has earned the trust of professional farmers and gardening experts. Quickly gets rid of common pests like aphids, beetles, caterpillars, fruit flies, mites and thrips and hundreds more. 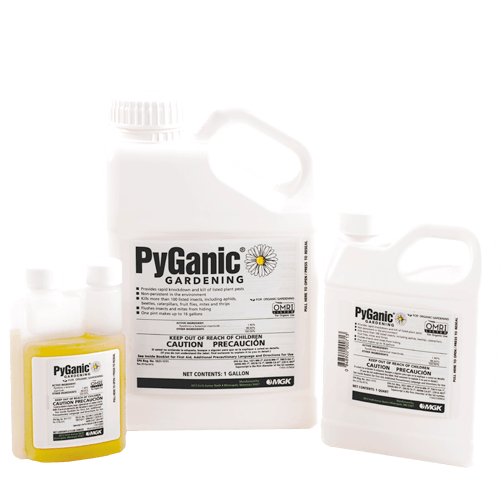 What bottle sizes are available for PyGanic Gardening? Where can I buy PyGanic Gardening products? When is the best time during the growing season should I apply PyGanic Gardening? Apply the product when you see pest present that you want to control. Pest can be present at any time during the growing season. The product does not have any residual killing so it will not last long enough to be a preventative. Does PyGanic Gardening kill scale bugs? If applied during the crawling stage (immature stage) it will be effective on scale bugs. How long is PyGanic Gardening good for after mixing with water? Is it safe to use PyGanic Gardening on cannabis plants? While the PyGanic Gardening label allows for applications to crops that can be ingested or consumed such as mint, hops and herbs, the US EPA prohibits cannabis from being listed as an approved crop on any registered insecticide. Is PyGanic Gardening harmful to blooms on plants and flowers? Will PyGanic Gardening kill earthworms in the soil? Earthworms are important model species for assessing the non-target toxicity of active ingredients. In general, Pyrethrins (active ingredients in PyGanic Gardening Gardening) have a very low acute toxicity to earthworms even when directly incorporated into the soil. In summary, under the application rates prescribed on the label, PyGanic Gardening will not have negative impact on earthworms in the soil. Is this product considered an insecticidal soap and can it be mixed with neem oil to boost effectiveness? Pyrethrin is an insecticide and not a soap. It kills certain insects by affecting their nervous system. It is derived from Chrysanthemum, considered safe, and has been used for thousands of years. MGK also sells Azera products that includes the active ingredient in neem oil, Azadirachtin. Does PyGanic Gardening have an organic listing? Yes, PyGanic Gardening is OMRI listed and meets USDA’s National Organic Program (NOP) requirements. Will PyGanic Gardening kill fleas? Fleas are not listed on the label. Will PyGanic Gardening kill Butterflies? PyGanic Gardening can be used on flowers and flowering vines. However, using the product when beneficial insects are around could be harmful. Best to apply early morning or late evening when these types of insects are not around.